On Friday, when the Brexit win was announced, London was in disarray. It was as though the character of the city had vanished – or so it felt in that moment. Pride London 2016 couldn’t have come at a better time. 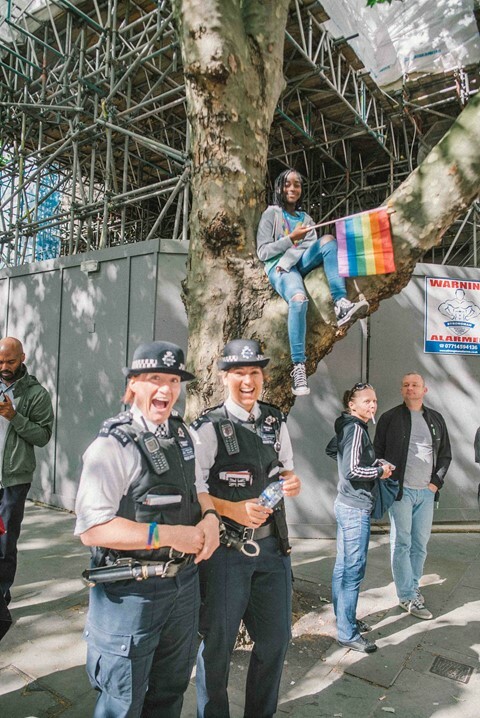 Starting at the West End, 40,000 people took to the streets to celebrate the unity of the LGBT+ community with a zeal and solidarity that showed us just how much good there is in the world. Simon & Garfunkel’s “Bridge Over Troubled Water” rang through the streets in perfect harmony, courtesy of The London Gay Men’s Chorus. Following the response from their performance at London’s vigil for Orlando a couple of weeks ago, they’ve released the song as a charity single with all proceeds split equally between the Orlando Victims Fund and Galop, the UK’s LGBT anti-violence charity that supports victims of homophobic, biphobic and transphobic hate crime. Pride London is the largest one-day event in the capital city and one of the biggest LGBT+ celebrations in the world. It's Chairman, Michael Salter-Church, announced that “No Filter” was this year's campaign slogan. “No Filter is a call to arms. A call for people to be themselves, to live as their true selves,” he proclaimed on what the phrase means in relation to the celebrations. For the 43rd year running, flags, face paint, flowers and all-around festivity helped to raise awareness and communicate the importance of being true to yourself. The unforecast cloud that made London a vacant, muggy haze the previous day was cleared as a gleaming, polychromatic rainbow spread over the city. Follow Pablo Di Prima on Instagram here.